I’m going to detail my paleo experience for you week by week! We’ll start on September 8th, a Thursday. I decided to start on this day with cutting out sugars and sweeteners. As a result I switched to “bulletproof” (or as I will here on out refer to as “buttered”) coffee. It was okay my first tumbler full. With each successive tumbler of buttered coffee, I liked it more and more. I also started drinking my weekday daily iced tea without the pink packets to sweeten it up. I’ve drank tea before without sweetener in it and I like it fine. I did do a juice day where I didn’t have any solid foods this day in an attempt to help my GI tract reset itself as my general gut healthy has been quite horrible lately. • Friday, September 9th…lost a legit .6 pounds thanks to yesterday’s liquid only diet for a day. Liking the buttered coffee even more! I really like it especially right after I’ve blended it because it’s got a nice frothy top to it, kind of similar to the froth from steamed milk on a latte, only this tastes better to me than the steamed milk froth. I did have a donut and a few homemade gingersnaps on this day. My “last hurrah” with sugars/sweeteners of any sort for at least 4 weeks. • Saturday & Sunday, Sept 10th/11th…last weekend before starting up “officially.” Saturday I ate sensibly. Protein waffles for breakfast, miracle noodle spaghetti for lunch, Taco Cabana beef street tacos for snack and a Chobani flip yogurt for dinner. Sunday, I had my last prepped serving of protein waffles pre-long run, then for lunch I had 2 Whoppers w/bacon (no cheese), and for dinner I went to a friend’s house and we ate the best homemade lasagna I’ve ever had with a salad (I was very light with the dressing…only like a tbsp at most), breadsticks and homemade apple cake (I had 2 pieces of that!). I also did all my meal prep for the week on this day…nothing out of the norm there. I meant to take “before” pictures and measurements today, but I completely spaced on it. 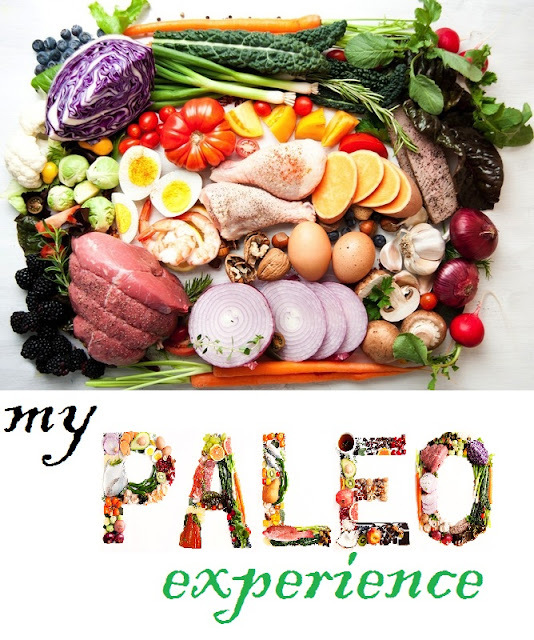 • Monday, Sept 12th…the “official” start of my paleo journey/experiment! Since I had appointments all morning, I ate my 2 slices of bacon before leaving for them at 7:30. When I got back home after my appointments at noon, I scarfed down 6 boiled eggs as I got ready for work. As I was packing my food up to take to work, my first thought was “I don’t know if I can eat all of this food!” And the fact that I plugged everything into My Fitness Pal and it’s over 2000 calories. BUUUUUUT, it’s all whole, fresh, unprocessed foods (other than basic cooking processes). Around 3:30pm, I ate the half of a rotisserie chicken I took to work with me. Around 5 I ate the dry salad I brought (spring mix greens with grape tomatoes and blueberries). I have to say that the guy I’ve been getting advice from for this experience, Steven, he eat a lot of his food just with his fingers because his wife is from Morocco and they don’t really use utensils there. Anyway, a lot of people make fun of him for it (he honestly doesn’t care at all). Well, I ate about half my salad with my fingers and completely understand now. A dry salad is basically easier to eat that way. I found that I really wasn’t very hungry throughout the day. I tried to eat the skin on the sweet potatoes. I ate the first one, but couldn’t do the second one. I just don’t like it. Oh well, at least I tried. Then, when I went to work my overtime shift, I left my strawberries that were for my overnight snacking pleasure in the fridge at my regular assignment. Thankfully one of the girls at my overtime assignment gave me some almonds! Higher in calories, but also higher in healthy fat, so I’m not super concerned about it. Overall I felt great and satisfied with my food. I was never HUNGRY or anxious about food. In fact, like I said, I was afraid I wouldn’t be able to eat all the food I had brought with me to work. Other than a can of Coke Zero yesterday, I have been without sugar and sweeteners for 5 days. I used one of my toothpick-floss combo dealies and wow, I didn’t realize they were sweet and boy were they sweet. Like sickeningly so. • Tuesday, Sept 13th…day #2! I made it through the first day and now the second day of paleo! I remembered to do my “before” pictures and measurements today! Slightly late, but it’s okay. I’m using yesterday’s weigh in for my starting weight, of course. I am working a double shift again today and my strawberries from yesterday were still in the fridge at work, so I made sure to grab them today before making the transition to my overtime shift. Whew! Also, I only ate 5 eggs (scrambled) for breakfast today along with my 2 slices of thick-cut bacon. YUM! Everything was the same as yesterday. Was feeling a little tiny bit light headed today…probably from the complete lack of processed carbs and sugars. However, I did cheat a bit and had a small cake mix and cool whip lemon cookie that my bestie made, so how could I say no? I found the smallest one in the bag and that’s the one I ate. • Wednesday, Sept 14th…having some cravings for processed carbs…things like pizza…yea, mostly just pizza. I keep seeing pictures in my Facebook feed of people with pizza. Argh!!! I bet I could make a paleo pizza…gonna see if I can find a recipe for that this weekend. I said when I started this that if I wanted cheese, I’d allow myself goat cheese, so it’ll have goat cheese on it instead of cheddar or mozzarella or whatever. I could put some shredded rotisserie chicken, cut up bacon, onions, and tomatoes on it. YUM! • Thursday, Sept 15th…a regular day at work, just my normal PM shift. I swear I saw a tiny little bug bouncing around in my salad and then a few of the pieces of it were starting to turn gross, so I just threw away all the lettuce from my salad and ate just the grape tomatoes and the blueberries. HA! There was a piece of pin͂a colada cake. A small one. It was good, but a small piece was enough. I really gotta stop with these sugar cheats. If I’m going to do this right for the first 5 weeks, I need to stop. Starting on the 19th, when I go completely without sweeteners and sugar (with the exception of plantains and sweet potatoes), I will be better about sugar cheats. I promise myself. • Friday, Sept 16th…my first day off from work on the paleo diet. I started with 2 slices of bacon and then did a 7 mile run. After that, I had 4 scrambled eggs. For lunch I had a broiled and seasoned steak. I had a few of the Epic and Lara Bars and 1 of the toddler squeezie pouches pre-race and throughout the day. Probably too many, but I was just on the go all day so that was the best option for me. • Saturday, Sept 17th…second day off from work on the paleo diet and this one included a meal out. My bestie and I went to one of those dinner theaters and I opted for the “brewhouse burger,” minus the bun, cheese and remoulade, add bacon, avocado and extra lettuce, at the theater we went to. They didn’t have any actual paleo-friendly options, so I had to ask for the substitutions. They unfortunately didn’t have sweet potato fries (what? Seriously? Everywhere had sweet potato fries except Flix!). Since I was also somewhat on the go this day as well, I had a couple of the paleo-friendly protein/nutrition bars and then a squeezie pouch when I got home for my dinner. • Sunday, Sept 18th…third day off from work and still chugging along! I’m so proud of myself. I would estimate that I have stuck with 100% paleo foods at least 90% of the time for the past week. Today for breakfast I had 2 sweet potatoes and 2 slices of bacon. That is to be my new pre-long run eats. After the run I was seriously craving eggs, so that’s what I made. Plus I ate the venison sausage I bought at Buc-ee’s Friday on my way home from the Loteria Run. I had a couple of the paleo nutrition bars, and I tasted a little while I was cooking (baked zucchini and yellow squash, pan fried plantain slices). Today was meal prep day. Oh I also had a 2-ingredient smoothie: cashew milk and strawberries. Was quite tasty. I’ve decided that I’ll be posting these updates on Sunday evenings…so keep an eye out for them! Since I run and I’m currently training for a marathon (will be perpetually training through at least mid-February since I am running 3 marathons again this season! ), I need to consider fueling on my long runs. I obviously cannot do gels because they are packed with SUGAR and sugars and sweeteners of all varieties (other than fruits) are strictly forbidden when eating paleo, so I had to come up with other options. So I did an internet search for paleo running fuels and came up with the following list of items: baby/toddler squeeze pouches, dates and raisins, Lara Bars, Epic Bars, and Tanka Bars. Something that came recommended from another co-worker who did paleo for a year is that I go a month without ANY sugar, including natural sugars from fruits. Since this advice came after I’d already bought blueberries and strawberries to munch on last week, I decided that this past Sunday I would start 4 weeks of absolutely no sugar. She did say when she did it that she would still eat plantains, so I will do that too. I’ll fry them up in coconut oil on the stove top. I think that would make excellent running fuel as well. I wonder what fried plantain and baked sweet potato mashed together tastes like? Guess I’m going to find out!!! Poll - Help! Which one should I run?? ?